Are you among the 120 million Americans who are missing a tooth? Although it is only one, it has caused many new challenges in your life. Not only was your confidence lost along with the tooth, but your ability to chew many foods and speak clearly. At Boston Smile Center, we understand it has negatively impacted your quality of life. 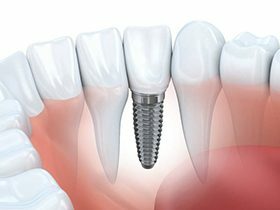 We can help you regain the next best thing to your natural tooth with an implant-retained dental crown. 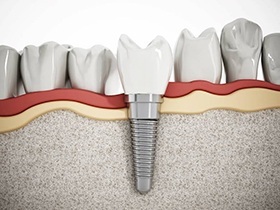 With the use of an implant post, you will make a long-term investment in your smile. A dental implant has become the most preferred solution to treat tooth loss because it offers a 95% success rate. It has the potential to remain in place forever because it replaces both the root and crown of a tooth. This allows it to look and feel natural while also providing many added benefits that are not possible with other options. Long-Term Results: Your jawbone fuses to the implant post, so it can last for a lifetime. Looks and Feels Nature: With your jawbone fused to the post, the tooth will closely look and feel natural. Improved Oral Health: A dental implant provides your remaining teeth with the support they need to stay in place. This reduces the risk of additional tooth loss, tooth decay, and gum disease. Preserves Your Jawbone: The implant posts stimulates your jawbone to preserve its density. To be a candidate for the procedure, you must have good oral and general health. In addition, you must have adequate bone density to support the post. If you do not, bone grafting can be used to resolve the issue. Using high-quality imaging equipment, the ideal location for the placement of your post is pinpointed. To insert it, you will need a surgical procedure. While under sedation or anesthesia, your gum tissue is opened to expose your jawbone. A small hole is drilled into it, and your gum is sutured closed. Over the next few weeks, your jawbone will fuse to the post. After you have healed, an abutment is attached to it. This is a connector piece that allows the custom-made crown to be placed. Your crown is designed to meet the size, shape, and color of your natural teeth to look natural. Using impressions of your mouth, the restoration is made from all-ceramic material. After it is crafted to meet your exact needs, it is attached to complete your smile. 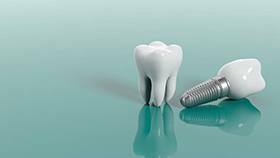 There is not set price for dental implants because the amount is based on your individual treatment plan, such as if any additional procedures are needed. In some cases, your dental insurance can be used to help lower the cost. During your consultation, we will provide you with an estimate and discuss your payment options. Stop feeling insecure about your missing teeth. Achieve a beautiful smile with an implant-retained dental crown. Contact our office today to schedule your consultation.